A great tactical RTS with all the gorgeous aesthetics and atmosphere of the original series. This must be the winter of derelict spaceships in endless deserts. 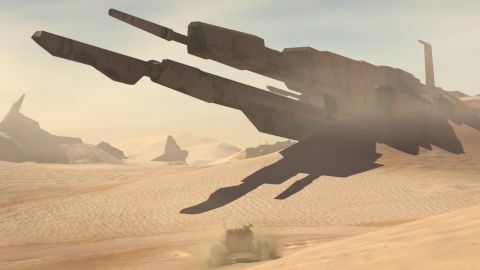 Between Homeworld: Deserts of Kharak and The Force Awakens, this season has been filled with the stirring sight of a familiar hull rising out of the dunes, carrying with it the conviction that there's something out there worth salvaging. But Deserts of Kharak does more than mine the iconography of a strategy classic for nostalgia. It creates a setting and story that is at once distinct from the earlier games, yet also enriched and informed by them. It finds in the desert the same stark beauty that Homeworld found in the darkness of space, and uses it as the setting for an approachable yet satisfying real-time strategy game. Deserts of Kharak takes place long before the events of the original Homeworld, but never feels overshadowed by what's to come. As it opens, your civilization is clinging to life on a vast desert planet, besieged by technologically advanced religious fanatics, the Gaalsien, who make their home in the desert wastes. The main character, Rachel S'jek (random apostrophes rarely imply good sci-fi, but Deserts of Kharak overcomes them) departs aboard the carrier Kapisi on a do-or-die mission to recover a powerful artifact from the heart of the desert. All hell breaks loose immediately following the Kapisi's launch as the Gaalsien embark on a final attempt to exterminate the various tribes of the northern Coalition. The carrier fills the same role as the mothership in the earlier Homeworld games, with one important difference: the carrier is a powerful warship that can turn the tide of a battle single-handedly. So on the one hand, your carrier must protected since it's where you research new unit types and upgrades, in addition to being a mobile airbase. On the other hand, it's a monster in combat that can be decisive in a battle. In addition to being a powerful tool, the carrier is also a lot of fun to watch as fighters and bombers scramble from the flight deck, and returning aircraft are brought into hangars for rearming between missions. Like everything in Deserts of Kharak, the carrier features of a ton of nice little details that bring the clean, ascetic models to life. It's a handsome game. I ran the game on the second highest settings, and observed a steady, smooth framerate throughout except in a few cases where multiple explosion and smoke effects were happening at once, and experienced no crashes. Combat among the canyons and plains of the desert is surprisingly similar to the space-combat in the earlier games: line-of-sight and army composition are the big keys to victory, followed by secondary factors like unit positioning to take advantage of high-ground vantage points, which give you bonuses. Control groups generally do a good job of keeping a sensible formation so you can use attack-move commands without much fear, most of the time. While each unit type counters and is countered by other units, this isn't a game where having the wrong army means instant death. Even with the wrong units, you can sometimes brute-force your way through battles, or withdraw before things get too hairy. The fact that armies take time to grind each other down than in other RTSes also made battles feel a little more fun, with more opportunities to play general. It's more about tactics than production, closer to Myth or the Wargame series than to something like StarCraft. You're amply rewarded for taking the time to micro-manage your armies as well. Units gain experience and veterancy bonuses through the battles and campaign, so that a “Commander” level railgun tank is hitting twice as hard and is three times as resilient compared to its rookie counterpart. That kind of efficiency is why it's more valuable to maneuver and position your armored units by hand rather than just focus on macro-production. Since the unit count is fairly low in Deserts of Kharak, this is definitely a game that's more about tactics than production, closer to Myth or the Wargame series than to something like StarCraft. The missions themselves leave a bit to be desired in terms of pacing. I was always left alone while my salvagers picked the map clean of resources, which made of a lot of dull waiting around, but the persistent units and resources in the campaign encourages exactly this kind of cautious, risk averse play. After a game like Legacy of the Void, where there's always some new crisis to deal with, the missions in Deserts of Kharak seemed a bit too passive, waiting for me to trigger the next event rather than creating a sense of urgency. Multiplayer is another story. While I'm disappointed there aren't more maps (perhaps an admission that one stretch of rocky desert looks much like another? ), I was surprised how much I liked Homeworld's simple multiplayer mode. On the one hand, multiplayer is all about protecting your carrier. First person to lose the carrier loses the game. But there are also artifacts scattered around the map that you must capture and deliver to an extraction point. First player to five artifacts (or more, depending on how you set up the game) gets the victory. That makes for some great duels as players camp each other's extraction points, stake out artifacts, and jockey for map dominance with their mighty carriers. You can turn off artifacts and just play for carriers, but I highly recommend the vanilla settings for a good mix of big battles, hide-and-seek with supercarriers, and drag races between armies racing for artifacts. The two factions, the Coalition and the Gaalsien, feel rather similar. In general the Coalition units are slightly more versatile while the Gaalsien are more specialized. The main difference between sides, however, is that the Gaalsien can produce units practically wherever they want, while the Coalition are tied to their carrier, which completely changes the relationship each side has to the map and made for some terrific blind man's bluff-style multiplayer matches. Homeworld: Deserts of Kharak sounded almost sacrilegious at first. Over a decade since the last Homeworld game, it was going to take a game remembered for its spaceships and 3D movement and turn it into a ground-based RTS with tanks? And it was a prequel? Yet in spite of all the ways this could have gone horribly wrong, Deserts of Kharak succeeds on almost every count. It's not only a terrific RTS that sets itself apart from the rest of the genre's recent games, but it's also an excellent Homeworld game that reinvents the series while also recapturing its magic.